Getting to Bonaire is not always quick or easy but it’s worth it! Bonaire has a small airport that recently changed names from Flamingo International Airport to Bonaire International Airport or BIA. The airport code for Bonaire International is BON. From Houston a flight leaves for Bonaire on Saturday Afternoons around 1pm and arrives in Bonaire around 7pm. Return flights back to the US leave Bonaire for Houston Sundays at around 8:00am and for Newark at 3pm on Saturdays. New direct round trip flights between Miami and Bonaire on American Airlines are scheduled on Saturdays and most weekdays during the winter months (high season.) Flights leave Miami at 12:05pm arriving in Bonaire at 3:15pm and depart Bonaire at 4:05pm arriving Miami at 7:15pm. The plane for these flights is an Airbus A319 with 128 seats. Another option is to get to Aruba and take an Aruba Air or Divi Divi flight from there (possibly connecting in Curacao). There are quite a few options from various cities around the US to get to Aruba. Aruba is a little farther away from Bonaire and the flight from Aruba to Bonaire could involve a stop in Curacao – so generally speaking Curacao is a better option if you can’t get to Bonaire direct on Delta or United. Southwest Airlines can get you to Aruba on the cheap and pretty much any day of the week. But you’re going to have to put up with a few changes of plane if you’re coming from anywhere other than Ft. Lauderdale. (Your location to Fort Lauderdale and from there to Aruba and from there to Curacao on Insel Air, changing planes yet again for Curacao-Bonaire. This island-hopping option could work for travelers spending a few days on each of the ABC islands. The only way to get to Bonaire directly from Europe involves a stop at Amsterdam’s (Amazing) Schipol Airport. KLM flies daily between Amsterdam and Bonaire. A nice tip is that these flights make a triangular pattern, Amsterdam – Aruba – Bonaire but the direction of the triangle depends on the day of the week. Some days it’s Amsterdam – Bonaire – Aruba. So it is possible to schedule your entire trip without the stopover in Aruba in either direction if you pay careful attention when booking. Because this flight is super long to start with the extra couple of hours it takes with the added stop in Aruba is a nice thing to plan around! The stop in Aruba isn’t always apparent when you book as it may appear that there is not a layover. The only alternative direct flight from Amsterdam to Bonaire is Arkefly (TUI). This is a charter company. You will only be able to research flights in the Dutch language on their website for flights between Bonaire and Amsterdam. They offer flights Tuesdays, Fridays and Saturdays direct to/from Amsterdam and are generally cheaper than KLM. SunWing Airlines, a Canadian low-cost air carrier based in Ontario, now offers non-stop service from Toronto to Bonaire on a Boeing 737-800 with a capacity of 189 seats. The service is temporary and ends when high season ends in April 2018. Watch for it again in 2019. Westjet Airlines, another Canadian low-cost carrier has non-stop service between Toronto and Curacao. From Curacao contact EZair or Divi Divi for a puddle jumper to Bonaire. Aruba Airlines Although Aruba is smaller than Bonaire, numerous airlines serve Aruba (AUA) from cities all over the US and probably a few in Canada and Europe. Aruba Airlines now offers direct flights between Aruba and Bonaire making it possible to get to our little slightly-more-difficult-to-get-to slice of paradise with a bit more ease. Flights are once or twice per day, Tuesdays, Thursdays, Fridays and Sundays on a 50-seat Bombardier CRJ-200 jet. Round trip Bonaire/Aruba is approximately $195 including all taxes and fees for for adults, $147 for children 2 – 12 years old, and $20 for infants. Divi Divi Airlines Divi Divi has planes that seat 8 passengers. They offer 8 or 9 flights daily in each direction between Bonaire and Curacao and continuing flights on to Aruba and St. Maarten. A one way ticket is about $80 to Curacao. Flights start at 6:40am and end at 7:30pm. On Saturdays they offer flights between Curacao and Brazil. 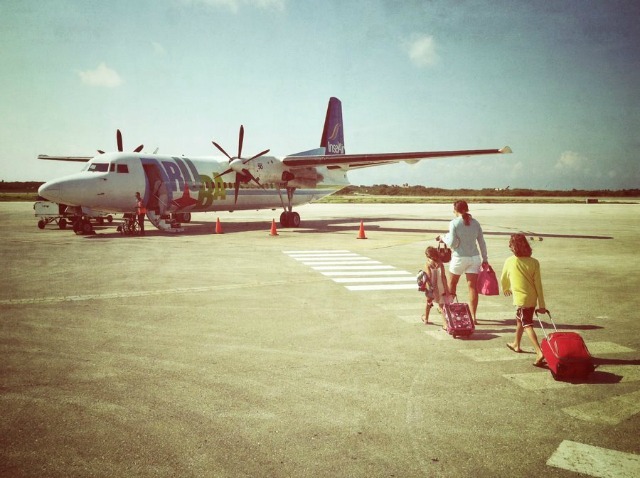 EZair is the newest airline to offer flights between Bonaire, Aruba and Curacao. As of this writing flights between Bonaire and Curacao are $85 each way, and between Bonaire and Aruba $145 each way. Most of the puddle jumpers allow a carry on and free checked bag up to 50 pounds. Insel Air operated on Bonaire for about 12 years ending in February of 2019. Insel is now out of business.